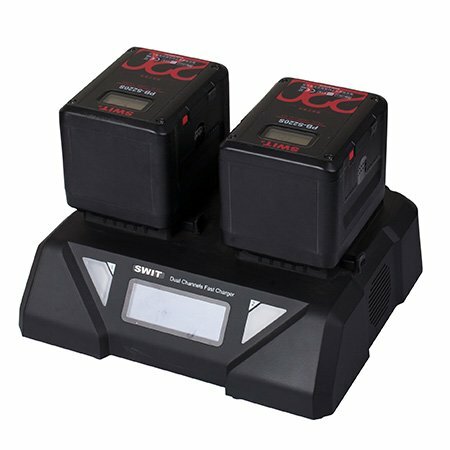 PB-S series camera batteries are compact designed, shorter than normal V-mount batteries, and match perfectly with most of the Cine-cameras. Consists of 24pcs of high class 18650 battery cells, nominal voltage is 14.4V and reaches 220Wh / 15.3Ah high capacity. Can run approx 7 hours for normal ENG cameras and approx 2.5 hours for ARRI ALEXA. Normal Li-ion batteries offer 100W/8A output and suitable for most ENG cameras, but the Cine Cameras such as ALEXA require around 85W high draw which is too heavy for the normal Li-ion batteries: the battery life will be reduced if long time full draw powering. Moreover, if there’re monitor, wireless system work together, and total power will be above 110W, and the normal batteries cannot draw completely. 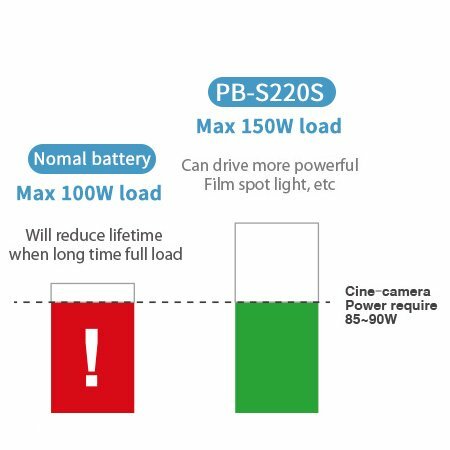 Using PB-S220S high-load battery, you can get MAX 150W/12A constant power output, which can drive more high power cameras, LCD Monitor and other equipments easily, and won’t reduce battery life during long time high power output. 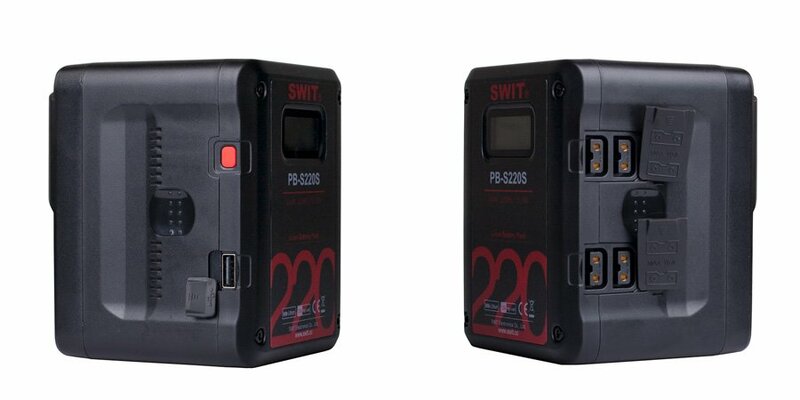 PB-S220S is equipped with 4 D-tap DC output sockets, which can power other on-camera equipments together. The Max output current of D-tap is 10A, 150W. PB-S220S is equipped with 1x USB 5V/2A output, which can be used to charge mobile phones, tablets and other portable devices. PB-S220S supports 6A fast charging by SWIT S-3812 fast charger, to save more than 50% charging time. 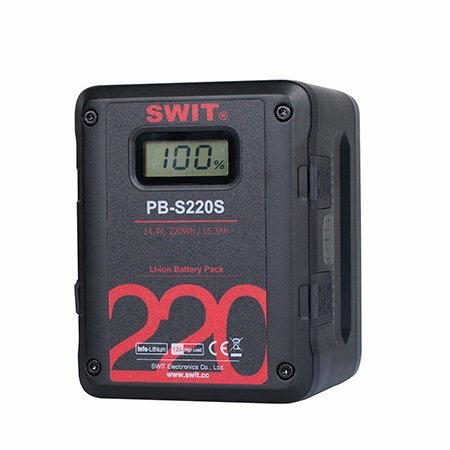 The 220Wh PB-S220S battery can be charged from 0 to 80% after 2.3 hours, and fully charged within 3.5 hours. P01 Run out of power, please charge the battery asap. P02 Over-voltage when charging, please remove the battery, discharge the battery to decrease the battery voltage to restore. P03 Over-current when charging, please remove the battery, and it will restore after 30 seconds’ standing. P05～P07 The load is too heavy, please remove the battery, and it will restore after 30 seconds’ standing. P08～P09 Battery short circuit, please make sure that there is no foreign body between the electrodes or remove the battery, and it will restore after 30 seconds’ standing. P10～P13 Temperature protection, please remove the battery and place at room temperature to recover. Warranty Period: One years conditional.